There are these persistent strains of black folk consciousness running through Tyehimba Jess's book Leadbelly and the series of poems that Treasure William is composing related to Fannie Lou Hamer. Even beyond the printed poems, we can witness aspects of that folk consciousness displayed in performances by Tyehimba and Treasure. 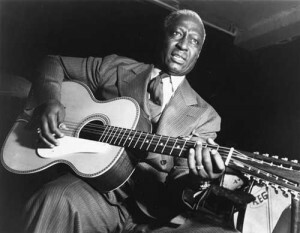 Tyehimba's book, comprised almost entirely of persona poems, charts the life and experiences of Huddie "Leadbelly" Ledbetter, one of our most legendary African American folk musicians. Tyehimba embeds his poems about the tough and troubled experiences of Leadbelly with ideas about black musical history, anti-black racism, myths, tense and loving relationships, intra-racial alliances and conflicts, migration, double consciousness, and various kinds of struggle. Tyehimba tells people he wrote a book about Leadbelly. I tell people he wrote a book about the souls of black folks. Treasure is taking up some work on the folk consciousness tip as well. Beginning in July 2010, she started posting short kwansabas, a 7-seven poem, in the notes section of her facebook page. 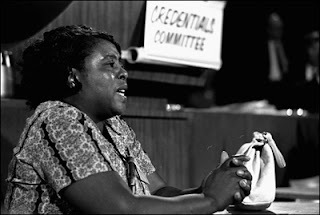 The poems were written from the first-person perspective of Fannie Lou Hamer, a notable Civil Rights organizer from Mississippi. Hamer was tough and fearless in the face of all kinds of Jim Crow and anti-Civil Rights racism. Treasure provides glimpses of Hamer's thinking as she confronts a number of different struggles. It's ironic, and perhaps simply the nature of poetry, that writers like Tyehimba and Treasure manage to write so gracefully about these two people with considerable hardships. The allusions to and uses of music throughout their poems give their works powerful folk qualities and so does the legend building processes created by their poems. Most notably too, the poems allow Tyehimba and Treasure to display their gifts as storytellers, representing the lives of their main characters one short yet revealing episode at a time. It's perhaps no small coincidence that Tyehimba and Treasure led careers as skilled performers years before arriving at their projects on Leadbelly and Hamer. As they composed their pieces, it's likely that they thought about how the poems might relate to audiences, not simply readers. And it's the awareness of audiences--audiences who rely on a variety of senses to experience poems that really connect the poems to the folk.